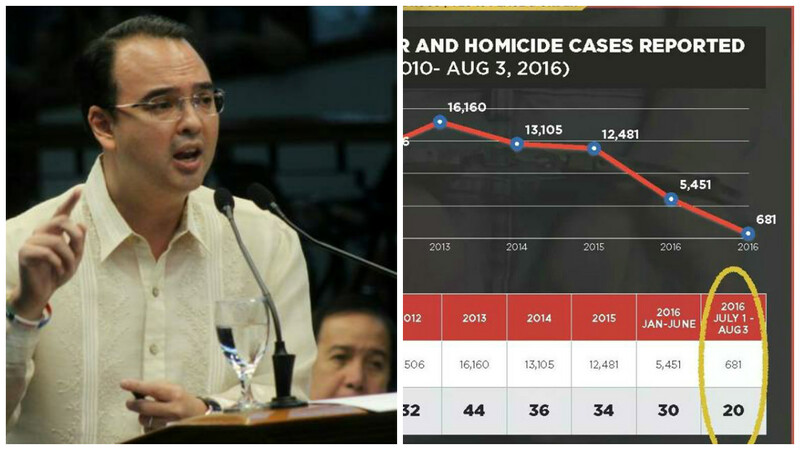 MANILA, Philippines - Sen. Alan Peter Cayetano, during the Senate hearing into the spate of drug-related killings on Monday, August 22, has revealed a data showing that there were more murders and homicides occurring each day during the Aquino administration compared to Duterte’s regime. The Senator who lost in his vice presidential bid in the 2016 National Elections said that people are now beginning to feel safe because of renewed trust on the government and law enforcers. The Senate probe headed by Sen. Leila De Lima aims to dig deeper in the rise of alleged drug-related deaths and supposed extra-judicial killings in relation to the government’s war on illegal drugs. Despite her word war with President Rodrigo Duterte who accused her of receiving drug protection money, De Lima promised to remain fair while presiding the two-day hearing. “I strongly believe: Extrajudicial or extralegal killings, whether perpetrated by the State or by non-state actors, must stop. Blatant disregard for human life has to stop,” De Lima said in her opening speech. Meanwhile, Senator Panfilo Lacson, who co-chairs the probe, expressed his reservations on the Senate inquiry saying that he knows the struggles of policemen in anti-illegal drug operations. According to him, the inquiry may affect the government’s campaign against illegal drugs. "As I have spent half of my life in enforcement, like them, I am not sure how many times I could have been... killed during police operations that I have participated in, number of times I could have landed in jail while performing my duties,” Lacson said. In his opening statement during the Senate probe, Philippine National Police Director General Ronald “Bato” De la Rosa insisted that crime syndicates are responsible for the rising number of summary executions of alleged drug personalities in the country. “The PNP’s stand against extrajudicial killings is uncompromising. If any cop is found violating the law on self-defense he will be investigated, prosecuted and accordingly punished,” dela Rosa said in his speech.